Hear the sound of high energy dogs everywhere barking for the dog food they crave? This perfect balance of fresh, ocean fish meal, deboned beef, and nutritious fruits and vegetables is a food designed with them in mind. It’s what’s needed to fully support your dog (or puppy’s) moonlight barking activities. From catching frisbees to completing an agility course, give your dog a food that will support the energy and nutrition necessary to keep them happy and healthy. Watch them leap and bound to success and unleash their inner gold! High performance dog food fors for medium and large dogs all-life-stages. Made with delicious deboned beef, eggs, peas and ocean fish meal for protein and for healthy skin and coat. 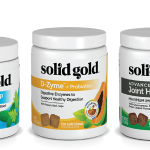 All of our Dry Recipes are Powered by GoldSource Core Nutrition – a carefully balanced combination of purposeful ingredients! Crafted with Ocean Fish Meal, Beef, Eggs, Peas and other wholesome and nutritious ingredients. Ocean Fish Meal, Beef, Pea Protein, Potatoes, Canola Oil (preserved with mixed Tocopherols), Dried Eggs, Peas, Tomato Pomace, Natural Flavors, Potassium Chloride, Choline Chloride, Salmon Oil (preserved with mixed Tocopherols), Dried Chicory Root, Taurine, L-Carnitine, Carrots, Pumpkin, Apples, Cranberries, Blueberries, Broccoli, Parsley, Spearmint, Almond Oil (preserved with mixed Tocopherols), Sesame Oil (preserved with mixed Tocopherols), Yucca Schidigera Extract, Dried Kelp, Thyme, Lentils, Vitamin A Supplement, Vitamin D3 Supplement, Vitamin E Supplement, Zinc Sulfate, Niacin, Ferrous Sulfate, L-Ascorbyl-2-Polyphosphate (Source of Vitamin C), Calcium Pantothenate, Thiamine Mononitrate, Copper Sulfate, Riboflavin, Pyridoxine Hydrochloride, Manganese Sulfate, Zinc Proteinate, Folic Acid, Calcium Iodate, Manganese Proteinate, Copper Proteinate, Sodium Selenite, Biotin, Vitamin B12 Supplement, Rosemary Extract, Dried Lactobacillus Acidophilus Fermentation Product, Dried Enterococcus Faecium Fermentation Product, Dried Lactobacillus Casei Fermentation Product. Con: Not all the dogs would eat it. Was hoping to reduce the amount I feed but that was not the case. Review: Great ingredients. Healthy and shows it in the dog’s stools. I like the smaller kibble as it is easier for the dogs to eat. If you have a finicky eater, this food is for you. 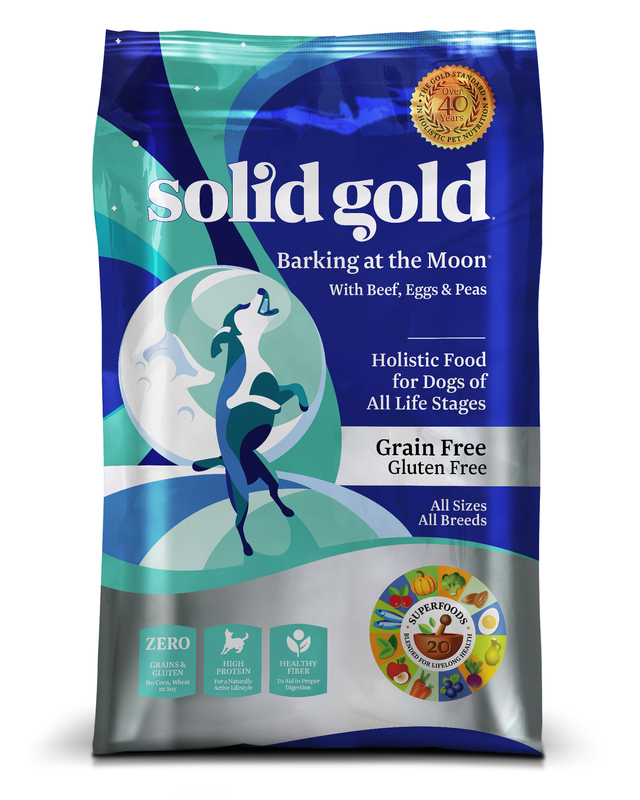 We added it to our usual Solid gold food and our dogs ate it right up. We also noted that our one golden, who is normally itchy, was less so this month. My dog loved Barking At the Moon, and her coat got shinier because of it. I think being grain-free is a great feature – grain seems to be a filler in many pet foods and I prefer feeding the higher quality ingredients. The higher protein content is appropriate for my young, high energy dog who expends a lot of energy in everything she does! Con: Barking at the Moon is a bit too expensive to feed a larger dog on a daily basis, but it works perfectly for my smaller dog to eat daily. My small dog transitioned from her regular food onto Barking at the Moon very smoothly. There was very little, if any, upset stomach involved with the switch. Although my larger dog doesn’t usually do so well with fish protein, I thought the quality of Solid Gold might make a difference. Unfortunately, she still had tummy troubles, so I’ll continue to avoid fish protein for her. I loved the transformation in Mitzy’s coat, smaller stools, and energy level. Her coat literally became the richest color I have seen on her, and very shiny. Her stools became about 75% smaller and from 3 x day to 2 x day. She has had increased stamina when I exercise her. We searched for a grain free dog food for our sensitive doberman when we got her. Our options were few; we are very happy with this food! Her poops are solid now (and her she has no gas! ), and her skin and coat are issue free. Our two slightly plump mini dachsies have slimmed right down, too! They all gobble this food right up. We even use kibbles as treats! 2 Features: No Wheat Gluten to worry about. No Chemicals. 2 Benefits: Big and Small Loved this food. Better food=Smaller Stools. I have 11 dogs plus 6, 8 week old puppies and everyone loved this food. The puppies did great with it mixed in with Solid Gold canned food; I like to warm it up for them. My 16 year old guy likes his with canned food and a little water, heated up and allowed to soften as he is missing his teeth. The others gobbled it up with and without mixing in canned food. Smaller Stools are an added benefit. Coats look GREAT and their Breath is actually better on this food. Couldn’t be happier. I’d recommend this to dogs of all sizes! Con: Need to add chicken to get my dogs to eat it. Neither of them were big fish eaters. Adding chicken or hamburger in the food worked great. I did notice both my dogs had a huge increase in energy! This is something you may or may not want when you have 2 great Pyrenees! You can small the ocean fish content of Barkin’ at the Moon. This indicates that your dog is going to receive a hefty portion of omega vitamins along with vegetables and bone strengthening ingredients. 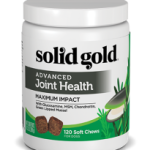 It is sure to help slim those tummies and keep those joints moving with ease well into the senior years. I liked that this kibble had smaller pieces than other foods – that helped my dog eat a little slower than usual. She liked the taste and didn’t have any problems with digestion. I’d recommend this kibble for all dog owners looking to add variety to their dog’s diet. 2 Benefits: My two finicky dogs licked the bowl clean, and icky potty times INSTANTLY changed for the better. We have two dogs, Lallo and Basil. Lallo has been incredibly fussy and finicky about his dry food and Basil has struggled with runny stool quite often, with various dry foods. The FIRST day we started them on Barking At The Moon Dry Food, Lallo has eaten his two meals without resistance, every day. Basil immediately got rid of the runny, icky, messy doo-doo! It’s never a pleasant job to pick up doggy poo in the yard, but if there’s anything that has made an easier task, Barking At The Moon has! My dogs seriously loved this food. Thanks for making my puppies so excited to eat their meals! At first I thought my dogs didn’t like it, cause they weren’t jumping right in. My older dog is very finicky, so I was a little concerned. But they ate it, and I soon noticed a change in my older dog. He started having more energy in just a few days. He was instigating wrestling matches with my younger dog, and chasing her around the yard like he used to. Obviously there is something in this food that puts pep back in his step! Con: This food is expensive to feed on a daily basis, so I will mix with their other food. I shop for a high quality dog food as my dogs are like my children and I am pleased over all with the ingredients and the fact my dogs love it. I feed my canines a mix of raw and dry food and I rotate the different varieties of dry food. This one, Barking at the Moon, is always in the line-up of rotations since the dogs love it so much.